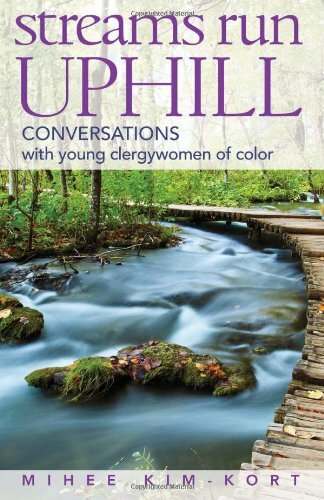 The recently published book, Streams Run Uphill: Conversations with Young Clergywomen of Color, poignantly opens up a whole new world for those of us who still see through the eyes of the dominant culture. The title’s Clergywomen of Color gives a small taste of the experiences these women have faced and continue to face. Yet these women also share much with their Caucasian sisters, such as growing up without seeing a woman preach, encountering shock when announcing they are pastors, loneliness, disrespect by parishioners, internalizing negative perceptions, and disentangling various contradictions. The primary goal of this book is to amplify the voices of these silent women in order to spark change. Through this book, these women have a platform to speak in their own culture, language and ethos. Each of the ten chapters features a clergy woman of color and may include short sections from Kim-Kort herself, as well as quotations from anonymous clergy women. The chapters categorically focus on ten struggles: sexism, racism, ageism, community, tokenism, family, legitimacy, finding one’s niche, voice/authority, and calling. Surprisingly, though the title refers to “young” clergy women, the only references to age concern past experiences that occurred at age thirty, thirty-something, and forty-two (96, 80, 37, respectively). While the narratives are easy to read, the concepts are profound. These women live with the daily pressure to adapt to the dominant white culture and bur y their ethnic heritage. One calls it “playing white” in order to be approved (69). There is an inward struggle between dissolving into the dominant culture and creating space for themselves. Kim-Kort shares that she often vacillated between two extremes in which she would adopt the voice and mannerisms of the group to fit in (losing self) yet would also sometimes speak up, only to feel like an awkward radical (63, 53). Another contributor shares how she lives in a “liminal state” since she does not fully belong in either place (The United States or China) as a Chinese Asian American (79). She lives between both places. These accounts show how churches need to learn to value unique cultural perspectives, talents, and values. One clergy woman expresses feeling afraid to simply let her large curls fall down, saying, “I can’t help but wonder if even my hair would deter people from hearing me preach God ’s word ”(20). In the post-worship receiving line, one man would always call an Asian American clergy woman “doll” because she reminded him of a porcelain doll (14). At introductions in ministry contexts, Kim-Kort rarely senses people are genuinely interested in her ethnic culture, and her parents hated her being called “cute” by her friends (19,58). While such outside perceptions and comments may seem nothing but a whisper to some, to these women they are deafening because such perceptions invalidate their cultures. One contributor, for example, endured a parishioner objecting to having more than ten Hispanic families at their church (111)! As clergy women of color, it is difficult to navigate and address such racist comments. Expressed through narratives, this book has a powerful prophetic voice because of its implications for congregations, denominations and theological institutions. Kim-Kort points to the issue of tokenism (using one person to suffice for representation) in ch. 5. Her denomination has a “Committee on Representation” where she has served as a minority representative. She has often wondered if tokenism is her “denomination’s version of affirmative action” (60). Kim-Kort shares how a friend who started the first anti-racist training at a seminary was saddened by invalidating comments and lack of non-minorities among future pastors (62). Thankfully, these stories also provide some answers for clergy women of color. While the tendency has sometimes been to hide their racial identity by means of their Christian identity, they have been able to break free by identifying how their ethnic culture has been devalued (69-70). Though negative perceptions can stick to them, they have learned to take these stickers off, refusing to internalize negative messages (42). Some have found creative ways of celebrating their cultures in their ministries, discovering that some people will indeed accept their gifts (51). This discovery involves a frightening yet necessary step—speaking in your true voice, whether it is ethnic, feminine, both or neither. Clergy women of color, this is a must read!